“Foiled again” get it? Ok, that would make more sense if I had previously written about gold foiling or even any kind of gold on clothes, right? Apparently I’ve been getting into golds lately. As exhibited by both some recent clothing purchases as well as nail polish choice. Earrings: Kohl’s daisy fuentes® Gold-Tone Hammered Drop Earring Set I had removed the chain portion of the coin style earrings and they look better. Tank: Talbot’s Outlet (one of my recent gold purchases) cream with gold foil streaks. Wrap: Tabot’s Outlet (in the fall) it’s a heathered cream linen that’s a perfect weight for spring and fall. Very versatile. Shoes: Lauren Conrad leopard print ballet flat from Kohl’s. Loving these, they also go with a LOT. 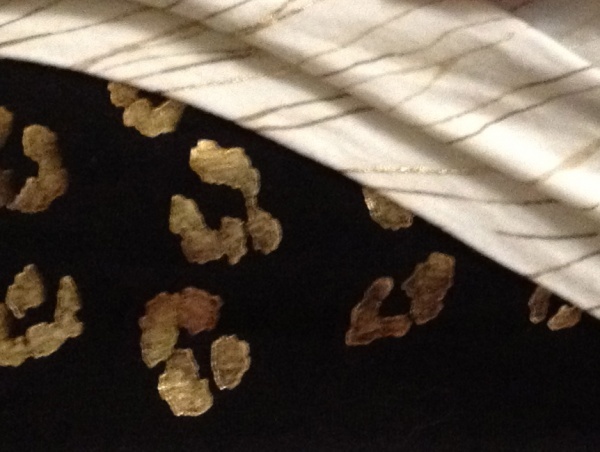 Close up of the leopard AND the Talbot’s tank’s gold stripes. Then there are the nails. Three coats of Essie in “A Crewed Interest” which is a Spring 2012 color. It’s a nice subtle effect that reminds me of gold leaf. 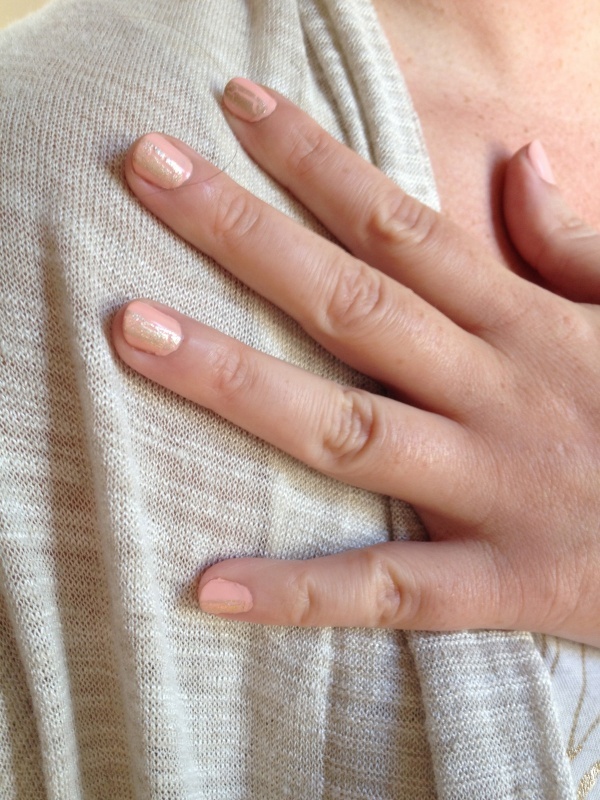 And the peachy pink is like a less sheer version of Zoya’s Lulu. That “point shoe pink / peach” I had been looking for for years and suddenly found. Repeatedly apparently. The gold crackle is actually a little preview of something I’m going to do a giveaway on sometime in the next month. So if you don’t normally read my blog, you might want to stay tuned by either subscribing to the rss, the emails or my twitter or youtube channels! Are you wearing more gold lately? Is this a trend or just a weird accident that I’ve recently purchased more than one item that was gold foiled? 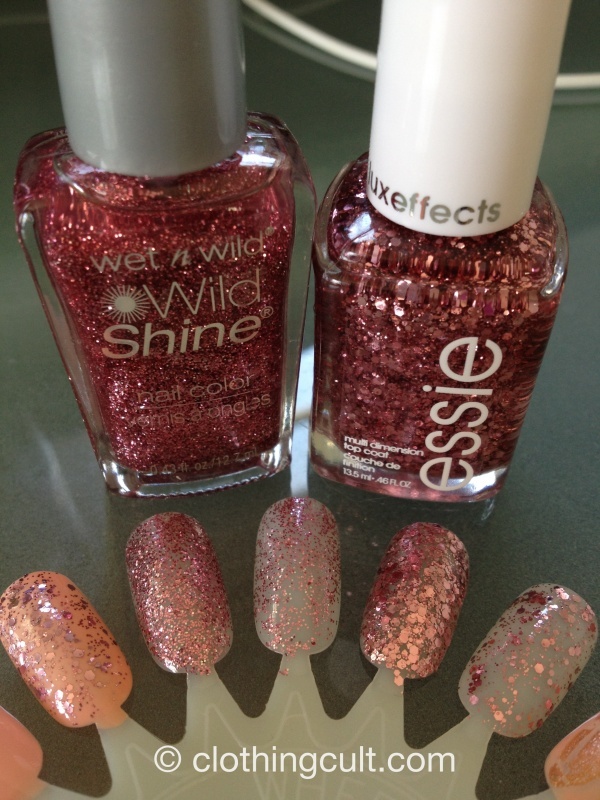 If you’re looking for a finer glitter I would go with the Wet N Wild but if you want a more confetti glitter look I would go with the Essie. If I had to pick between the two and could only buy one, I would go with the Essie even though it’s more expensive because it just somehow looks a bit more upscale and classier. I did however get the Essie in the March “Teen Vogue” Birchbox. There is also apparently a Revlon color that is, based on the swatches I see online, somewhere in between the two I’ve reviewed here. Revlon 261-Sparkling. I did a quick little video so you can see the two colors I reviewed just a little better.